This cinnamon scone recipe is easy to make if you have any baking experience. If you don't have much baking experience, read these scone-making tips before you start baking them. For an added treat, try serving these cinnamon scones with coffee or afternoon tea and with jam, clotted cream, Devonshire cream or cinnamon butter. In a large mixing bowl, whisk together flour, sugar, baking powder, cinnamon, and salt. Use a pastry cutter to cut in the butter. The mixture is done when it resembles coarse cornmeal. Add the whisked egg and vanilla extract. Do not stir yet. With minimal stirring, mix in just enough milk, buttermilk or half-and-half to make the dough stick together. It will be crumbly and there should still be a little bit of dry flour left in the mixing bowl. Turn the dough out onto a heavily floured cutting board. Knead the dough slightly. When it is done, it should be easy to handle and smooth. Gently pat the dough into two (1-inch thick) discs. Cut each disc into 6 pieces. Transfer the scones to a buttered or parchment-lined baking sheet and bake in the heated oven for 15 to 20 minutes or until lightly golden. Optional: Turn pan halfway through baking. A scone is a single-serving quick bread, usually made of wheat, barley or oatmeal with baking powder as a leavening agent and baked on sheet pans. A scone is often lightly sweetened and sometimes glazed with egg wash. The original scone was round and flat, sometimes quite large. It was made with unleavened oats and baked on a griddle, then cut into triangular sections for serving. When baking powder became available, scones began to be the oven-baked, well-leavened items that are more popular today. Modern scones are widely available in bakeries, grocery stores, and supermarkets. Scones sold commercially are usually round, although some brands are hexagonal. When prepared at home, they may take various shapes including triangles, rounds, and squares. 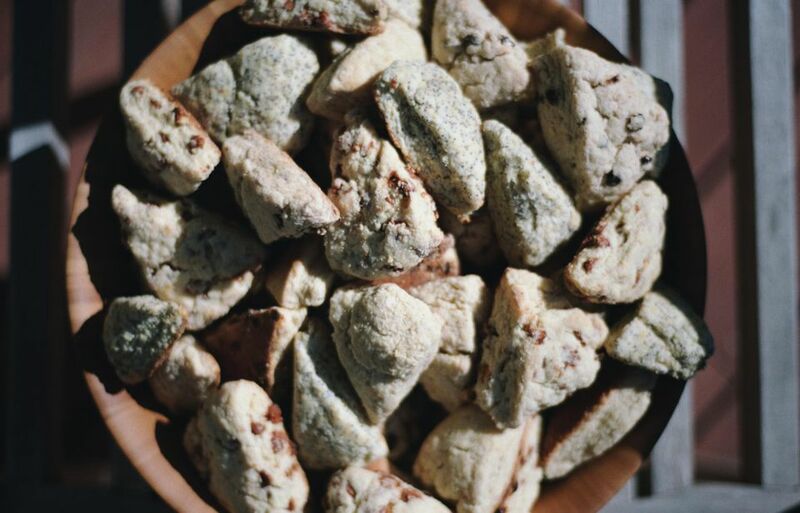 British scones are often lightly sweetened, but may also be savory. They frequently include raisins, currants, cheese or dates. The griddle scone is a type of scone which is cooked on a griddle on the stovetop rather than baked in the oven. This usage is also common in New Zealand where scones of all varieties form an important part of traditional colonial New Zealand cuisine. Other common varieties include the dropped scone, or drop scone, like a pancake, after the method of dropping the batter onto the griddle or frying pan to cook it, and the lemonade scone, which is made with lemonade and cream instead of butter and milk. There also is the fruit scone or fruited scone, which contains currants, sultanas, peel, and glacé cherries, which is just like a plain round scone with the fruit mixed into the dough. In some countries, one also might encounter savory varieties of scone which may contain or be topped with combinations of cheese, onion, bacon, etc.